As promised, I will be sharing my experience at the Vermont Quilt Festival. I did not register for any courses this year due to surgery but I did pay their fee to be on the mailing list for 2008. I visited the merchant mall and viewed the three exhibits they had this year. There was the regular quilt exhibit, the Alzheimer Exhibit and an antique quilt exhibit. Pictures were prohibited in the Alzheimer: Forgetting piece by piece gallery, however you may view what was in the exhibit here. It was an extremely touching exhibit. I spent a long day at VQF, with lots of rest in between. 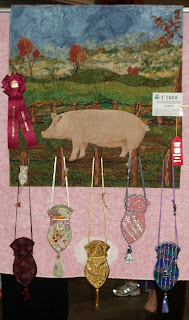 What I will be showing are quilts that I thought were special and that I wanted to share with my friends on Blog Land. 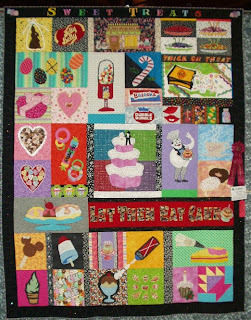 This is quilt C304 and is called Sweet Treats by Denise Lareau from Manchester, NH. It was longarm machine quilted by Nancy Tatro. Now, for my longarm quilting friends, isn't sweet, no pun intended ;o), that she gives credit to who machine quilted it? This is a raw edge applique quilt. I loved it! It was a fun quilt to look at. I couldn't help but think about copyright and trade mark when I saw her Bazooka and Bubble Gum block. I remember a huge ugly debate on a newsgroup regarding the same issue. Personally, I'm not bothered by the reproduction of the design. This is C219, Scrap Baskets by Catherine P. Boyle from Pittsburgh, PA. Except for the backing, the quilt is made entirely from scraps. I'm quoting from the Vermont Quilt Festival booklet. I will say, I don't know if I would consider all of that fabric as scrap. Perhaps the basket, but not the background. Perhaps she meant more from my stash. Who knows? I couldn't help but think of Darlene and her love of baskets when I came upon this quilt. This quilt is C1003 and is entitled You can't make a Silk Purse From a Sow's Ear, SAYS WHO? by Nancy DiDonato, Diamond Point, NY. What an original design. The purses were embellished with beautiful crystals. C802 Althea's Waltz in the Starlight Ballroom by Judith Heyward from Mt. Pleasant, SC. What a stunning quilt this was. The back was as beautiful as the front. This will be it for for now. I'll share more of my favourite later. I agree with you on the raw edge applique - I don't really think it's applique at all, but a separate technique. We're having so many new ideas in quilts, it's getting hard to come up with categories at our own quilt show. Only a few hand quilted items, but let's not forget them, folks! Love the baskets, and pigs ears/purses. Looks like you had a worthwhile trip. I love the basket quilt. THANK you for showing us these pictures, there certainly are many methods of making a quilt! 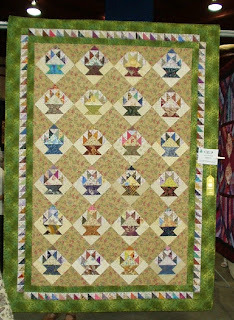 I'm glad to see the quilts from the VQF on your blog since there's no way I could be there in person. I have heard it's a great quilt show. Some quilts that I have seen in quilt shows as art quilts leave me a bit bewildered why they are chosen...it would be interesting to understand the criteria to distinguish the difference between the good, the bad, and the ugly. I've seen some that I personally would not have considered show quality that have been in the big shows. Shows how little I know about the subject. Thank you for the lovely eye candy!!! Hello: I'm the maker of Sweet Treats. What a nice surprise to see that you liked it enough to include it in your blog. 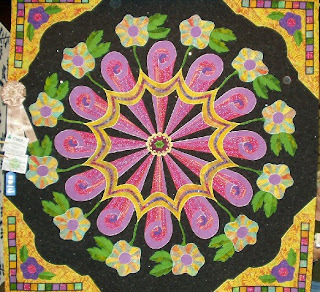 As far as the Machine quilter, Nancy Tatro, I firmly believe that my quilt would not have been accepted nor won any ribbons had it not been for her incredible machine quilting. When I brought the quilt to her she said, Do you Trust me? I did and told her: custom work and go for it- which she did. That truly was a cooperative effort. My husband drew my requests for the blocks, I executed them and Nancy but the "icing on the cake" with her quilting. It's a hot one today! Happy 75th blog posting anniversary! The beauty of it all! My baby turned 10 today!